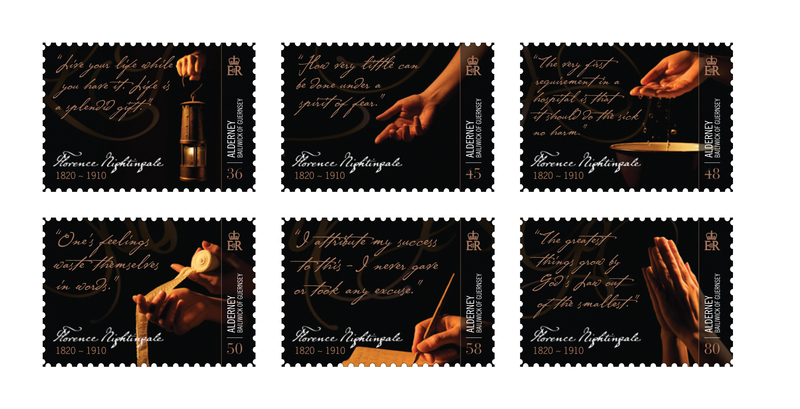 When The Potting Shed was commissioned to create a set of stamps to mark the 100th anniversary of the death of Florence Nightingale, the only thing they knew about her was her legendary moniker of ‘Lady of the Lamp’. The first step therefore was to delve into her life and find out more about this iconic figure. What the designers discovered was a life devoted to social reform and care - a woman of great character who sacrificed her personal relationships and health in devotion to her work. The research also revealed many facets to Florence’s personality including humanitarian, reformer, nurse, writer and devoted Christian. She was a prolific writer and her words resonate through the ages with an insight and humanity that is still powerful today.